This past week at the farmers market they had fresh Tat soi, which looks a lot like Bok Choi, but smaller and greener and when I cooked it I realized that it had a somewhat milder flavor. We love adding these greens in lentils or dal as we call it. I find a creamy thick bowl of lentils just what I need after a long day. My kids love the mild and comforting taste of lentils and actually love greens in their dal. 1. 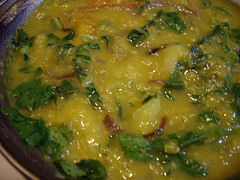 Place the lentils, water, turmeric, salt, tomato and onion in a pot and bring the water to a boil. Reduce the heat and simmer for 20 minutes, stirring occasionally. The lentils should be a soft, pale yellow, creamy consistency. 2. Heat the gjee and add the cumin seeds and wait for them to begin sizzling. Mix in the tat soi and cook till they are wilted. Stir in the lemon juice and garnish with the cilantro. 3. Serve with rice and salad for a light meal.